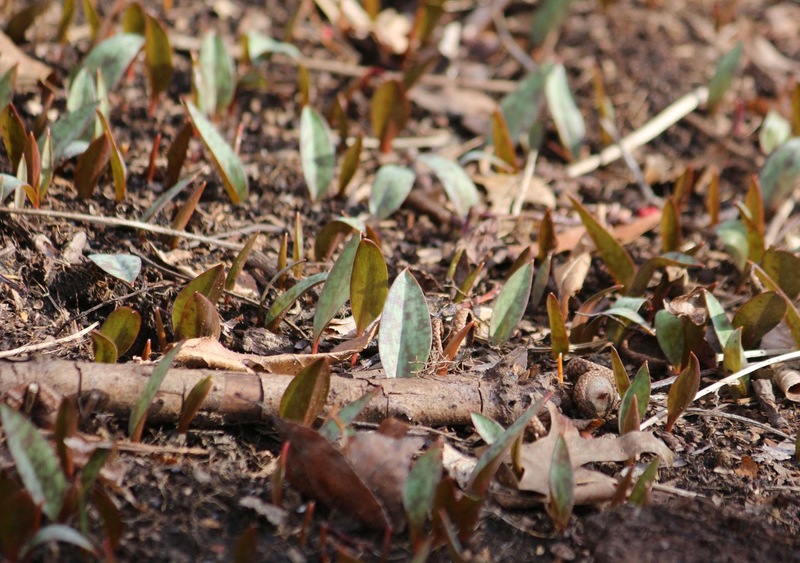 In about...ten days (big gamble) these native spring ephemerals - trout lilies (Erythronium americanum) - will be lovely. And in about... one week (licks lips) these highly invasive Japanese knotweed (Polygonum cuspidatum) will be ready to snip. The early red colour gives way to a lightly freckled bright green. Below - all those dead upright sticks? 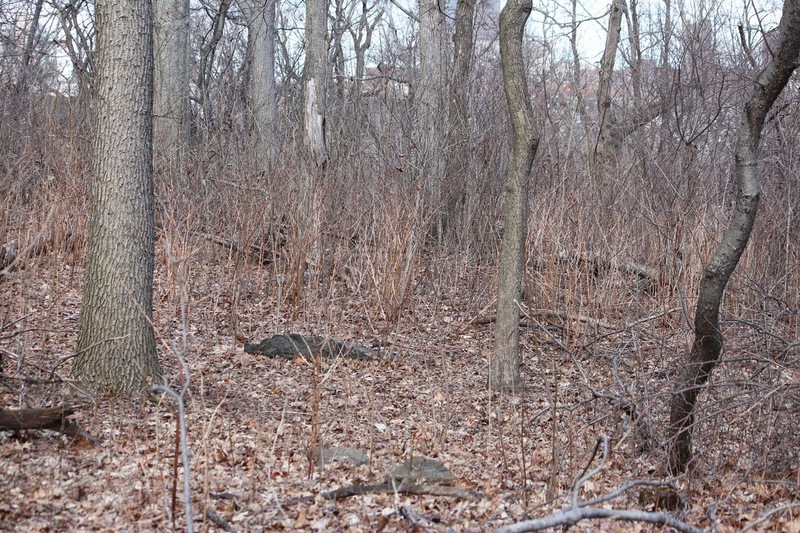 This is a Japanese knotweed forest. And the tall canes from last year tell me it was not sprayed. It's basically out of control. Mertensia virginica, Virginia bluebells. The truest blue. Delectable young leaves. But I'll leave these alone. You see the lesser celandine (fig buttercup) hugging its feet? 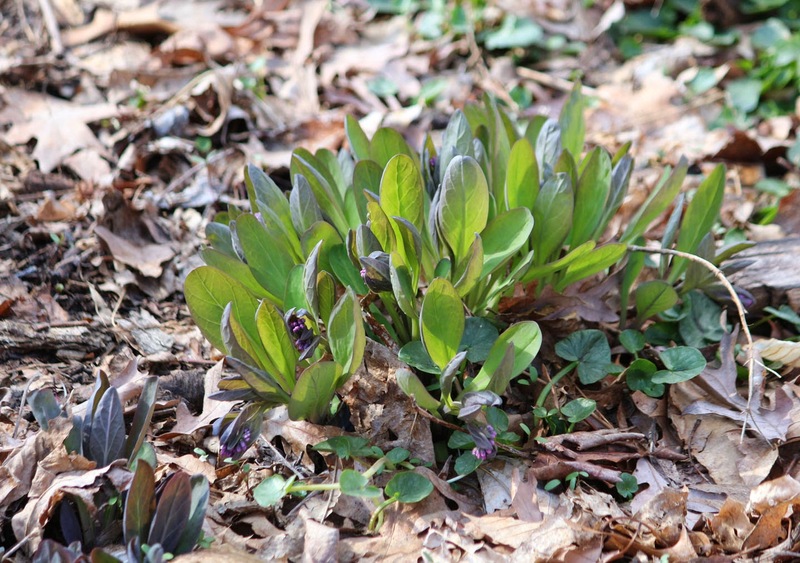 Terrible invasive weed, and the woods were carpeted with it. Ficaria verna, though I find it hard to remember that it is no longer called Ranunculus ficaria. 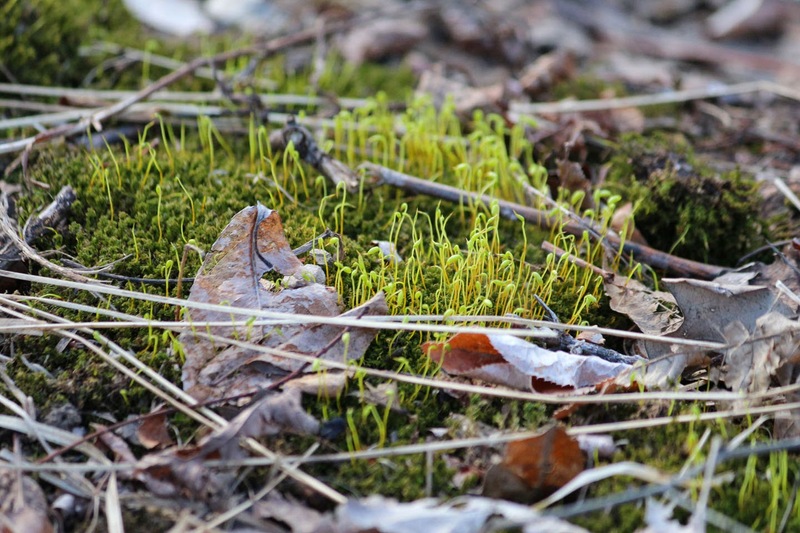 Moss, reproducing in a hurry. Ha! A northern flicker. Back of. Very hard to get the front. A woodpecker, but often on the ground. 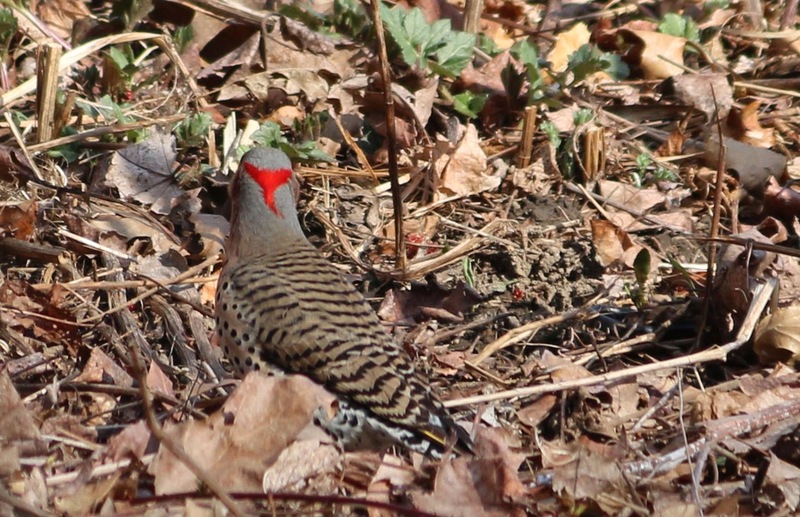 The leaves beyond the northern flicker were all growing with their feet in damp soil and sometimes in running water. 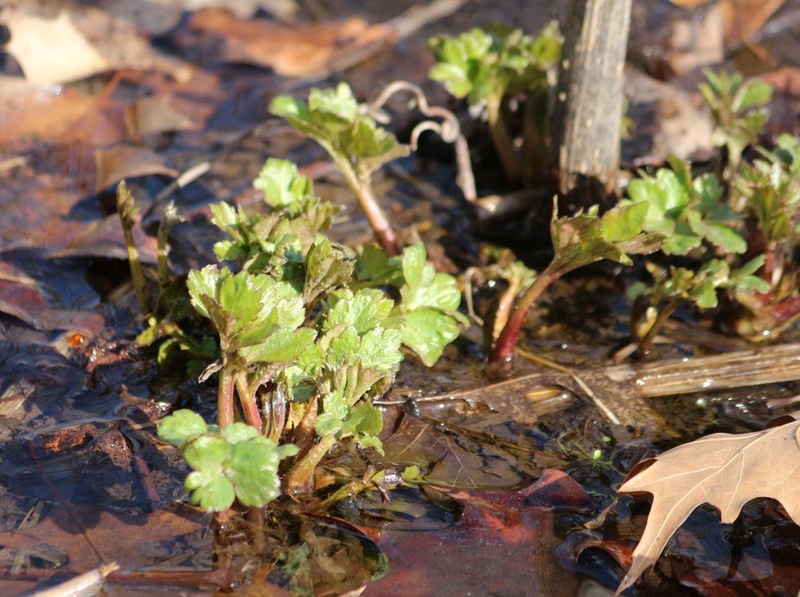 I don't know water hemlock at this early stage of growth, but I think that might be it. Famously poisonous. 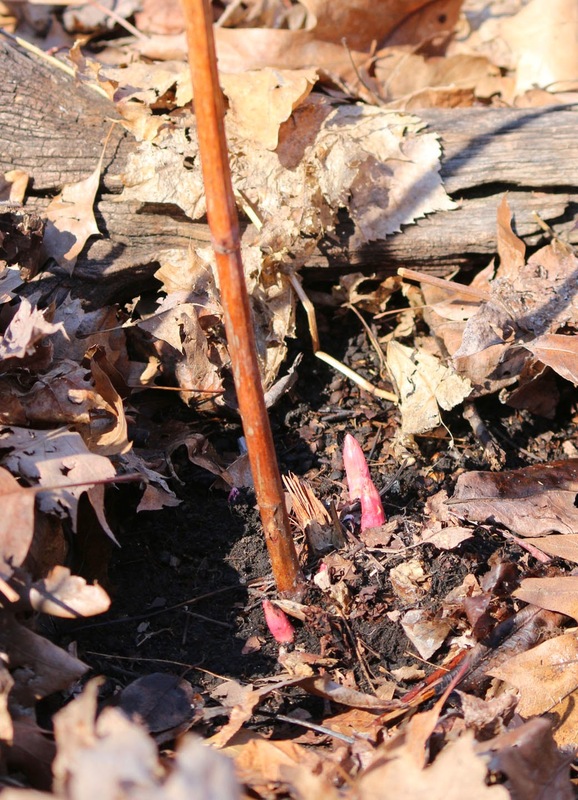 There were lots of dead, cut down stems from last year lying about, about five feet tall. 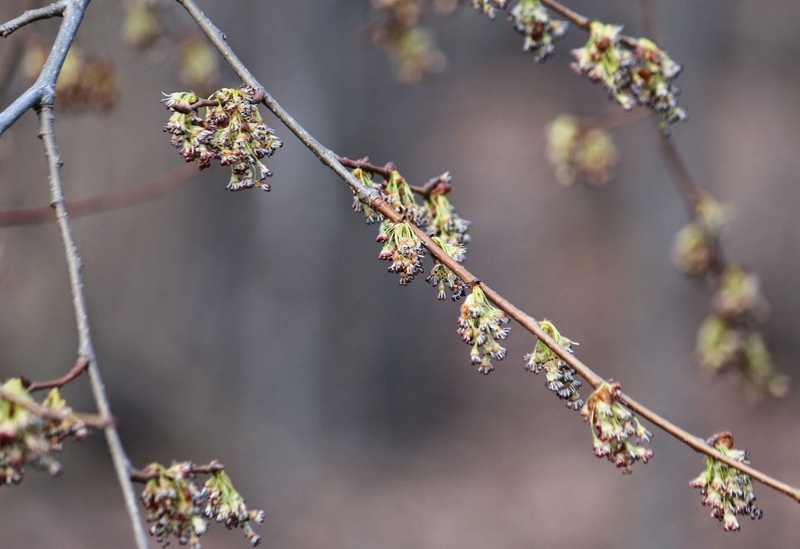 Trees are just beginning to break bud. And I heard a wood thrush sing. How beautiful to see the woods and the wild places of New York wake up. In some cases, explode into new life. Down here, at the bottom of Africa, everything is slowly going to sleep and then the mercury hits 30 (C) and up we go again - until tomorrow and it starts all over again. Who would be a plant during climate change ? We have flickers here as well as regular woodpeckers. I often hear the woodpeckers at work on phone poles when I'm out walking the dog Oh and robins, wrens, chickadees jays..the music of spring. What a walk you must have had! When I cleaned out my big front bed last fall, i carefully took out every single piece of Ficaria verna (i liked it better when it's name was Ranunculus facaria!) 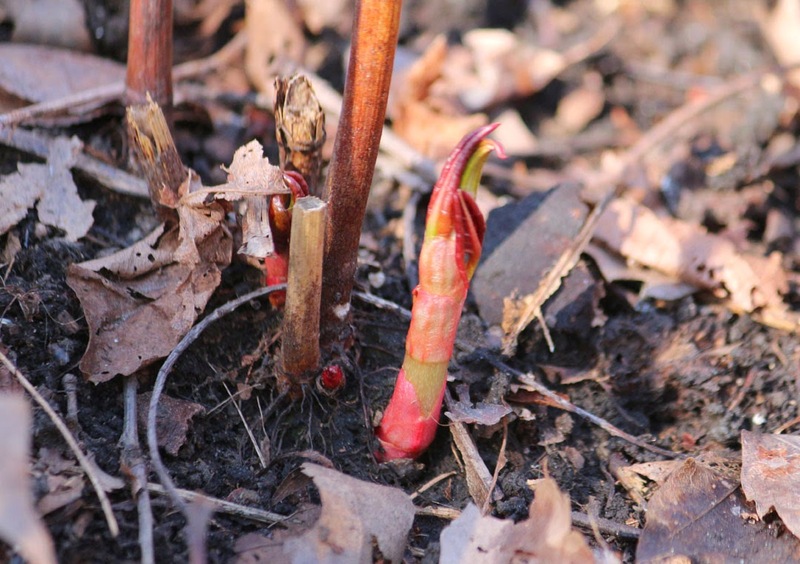 and i this spring i have twice as much as last year - invasive, indeed. Fear i must resort to spraying it this year. Hate to do that, but clearly i spread as much as i cleaned. So pretty, so bad. aargh! I wish I was close enough to go on one of your walks. I bet you make a great guide to wilds of Manhattan! 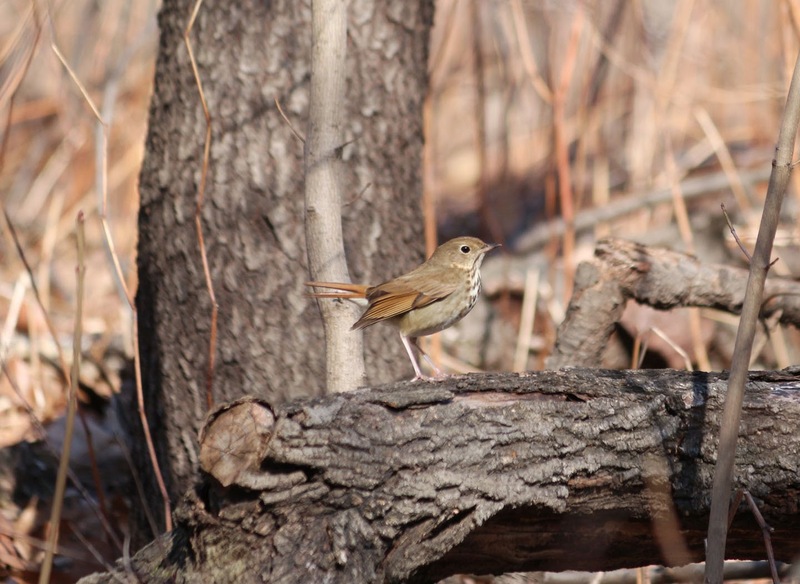 Btw I think your wood thrush is a hermit thrush (catharus guttatus).